After quite a bit of work with the long lens, this evening I wanted to give my brain a different kind of photo workout, so I headed down to the Olentangy River. The sunset petered out, but the post sunset blues made for a wonderful reflection in the full, ice laden river. The streak in the background is northbound traffic on St. Rt. 315, one of Ohio's busiest commuter freeways. I've posted this image over at my photo gallery, Tom Arbour Photography, in a much larger size. A wonderful picture of the Olentangy. I spent a lot of time exploring this river when I attended OSU in the 70's. Fascinating...the swirl of the water, the reflective light... unique! I am doing a ticket give away for The Great Big Cleveland Home & Garden Show that is Feb. 6 - 14. Stop by and check out my new blog fellow Ohioian! Your entire site came up in my browser and I said.... whoa, nice! Oh wow. This is nice. Looks like some thing syruppy at a soda fountain. Nice shot. 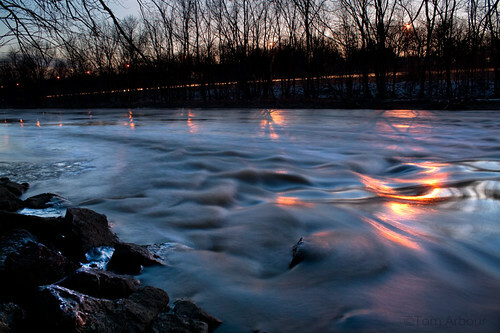 Tom: What a wonderful shot of the flowing water.